Nothing irritates me more when packing for a trip than having to get certain essentials together for the trip because you have packed them away. Problem solved, I now have a camping box that keeps these items together. Items are checked and restocked where necessary and I make a point of not lending them out or taking them out to use. When I travel I just throw the box plus my tent, tables and chairs into the load box before setting off. It’s great to know that everything I need to escape the big smoke is packed into a single box. So for reference, these are the key items that go into my box. A small axe and saw, essential for cutting wood around the camp, The small axe comes complete with a protective cover and a rubberised handle which is great for absorbing shock. A pot set with three pots, great for warming stuff on a gas stove or corner of the braai, the smaller pot doubles in need as a coffee cup. A 15-litre water container ( short trips), fits into the box so that I know it’s there to be filled as I leave. Most places I travel to have potable water but this just works for an emergency. Although it’s also part of my toiletry bag I also add in a few small tubs of sunscreen for good measure as well as mozzie repellant. I use a natural one as I am not fond of DEET and have heard that it degrades over time. A magneto torch and charger, this merely serves as a back up to my normal torches. A Morakniv Companion, carving, cutting, food prep and even starting a fire with a Ferro rod. Citronella soap ( multi-purpose soap, you can wash your hair with it and it even acts as an insect repellant. And it’s biodegradable. Leatherman multitool, a must have for a variety of tasks around the camp and emergency repairs. A jar with meths and old wine corks which I use as firestarters. A lighter and Ferro rod to start fires. A small dual fuel stove – I prefer Benzine as my fuel of choice but the stove is great for early morning coffee and tea. And it has a nice stable base. So my sleeping pads are in a sealed bag with the kit as is a spare medical kit, I also keep a bird book, binoculars and a magnetic chess set, reading material for the trip tends to be chosen from whatever I am currently reading. 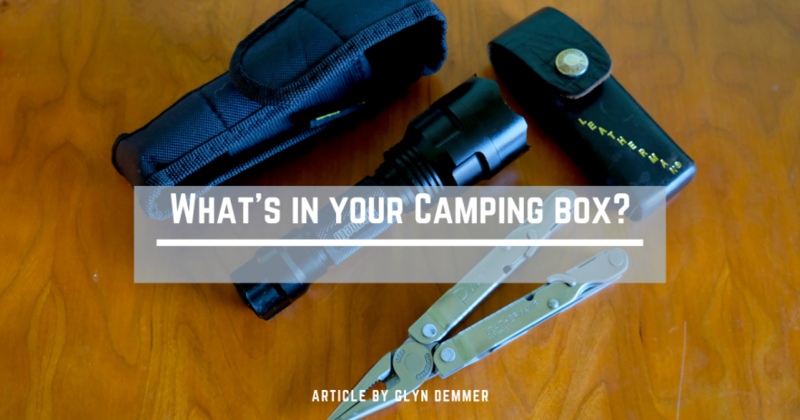 Lighting varies so the lights do not stay in the box, if there are no plug points I opt for gas and if the camp has plug points I then opt to use rechargeable lanterns. It’s a kit that has worked for me and I have pared it down over the years. I do not really braai so have not included braai tongs. Tools are the subject of a separate box and supplement the tools that I carry every day in my car. Oh, one last thing, I enjoy coffee, you will always find an unbreakable double walled stainless steel Lacafetiere French Plunger for the early morning brew!